Attorney General Jeff Sessions announced new measures the Trump administration is taking to support the nation's police force by eliminating Obama-era restrictions on law enforcement's ability to acquire excess military equipment from federal programs. "These restrictions went too far, we will not put superficial concerns above public safety, we will do our best to get you what you need," said Sessions at the National Fraternal Order of Police conference in Nashville, Tennessee on Monday. After the Ferguson, Missouri rioting in 2014, police were criticized for the use of military equipment like armored cars and large-cailber weapons on the streets. Obama ultimately signed an executive order halting many of the military surplus transfers. The executive action, which Sessions says Mr. Trump will sign sometime on Monday, will in effect reverse that. "Good equipment saves lives," Sessions argued, saying the executive order will ensure officers "will get lifesaving gear you need and sends a strong message that we will not allow criminal activity to become a new normal, saving tax payers money in the process." "We are not going to allow equipment no longer needed to be sitting idle when you could be using it," Sessions added. Sessions, during his remarks, claimed that studies have shown equipment like kevlar vests and military-grade helmets reduce crime rates, the number of assaults on police officers and complaints against police forces. He said by Mr. Trump taking executive action, the administration is making it "easier to protect yourself and your community" something he says will "aways be a priority of President Trump," whom he referred to as the "law and order president." 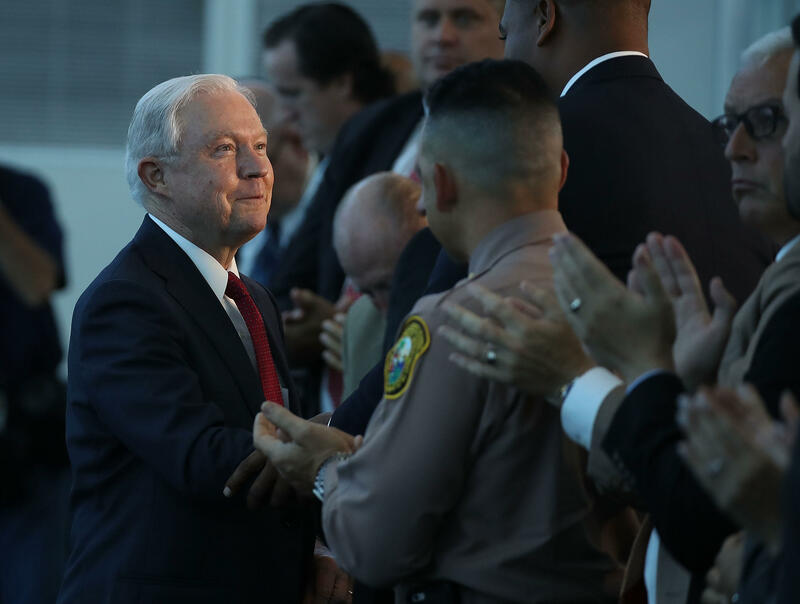 Sessions also used the morning speech as a moment to condemn "slander" against police, saying rising crime rates should come as no surprise amid "divisive rhetoric" against the police, which "treats police officers like they're the problem." "This president stands with you, not just rhetorically, but in thought, word and deed," Sessions added. "I am proud to stand with you and the DOJ is proud to stand with you -- we have your back, we back the blue."